I made this Mediterranean feast for my friend Kim last week, courtesy of a Guy Fieri recipe. The chicken was unbelievably tender and juicy (perfectly done despite my paranoia about cooking chicken all the way through) and the sauce…oh the sauce. It’s what made the dish. A combo of white wine, lemon and garlic, then add in sun-dried tomatoes (the liquid makes them plump up), olives and a touch of butter at the end — it’s a TON of flavor. You’ve got to like olives to give this a go, but if you do, you’ll love it. I’m not a big fan of stuffing chicken — it’s kind of a pain and I never manage to make the “pocket” quite right, but it actually worked out pretty well for me, despite one chicken breast being on the smaller side, which makes the stuffing part much more difficult. End result: super tasty. I love the tang and acidity of the sun-dried tomatoes and salty olives and feta, with a little crust on the chicken…delish! Try to pick chicken breasts that are on the bigger side to make the stuffing part easier. Give the chicken a nice browning on the stovetop before you put it in the oven — not only gives the chicken good flavor but you cook the sauce in the same pan and scape up all the yummy bits when you deglaze with the wine. Trim chicken with a boning knife, if needed. Start at top of breast and carefully make a lengthwise cut from top to bottom and making a pocket about 2 inches, making sure not to pierce the other side of the breast. When couscous is cool enough to handle, carefully spoon couscous mixture into pocket. Even out the stuffing by gently moving it around with your hands. Wipe off any excess couscous from outside of breasts and season with salt and pepper. Heat olive oil and butter in saute pan and brown off both sides of chicken. Place chicken on baking sheet and place in oven for 20 minutes. While chicken is baking, make the sauce. In saute pan that you cooked chicken breasts in, heat and add garlic. Deglaze with white wine and add lemon juice. Reduce by one third. Add in sun-dried tomatoes, let reduce for 2 to 3 minutes, add the olives, turn off heat, add the butter and stir to combine. 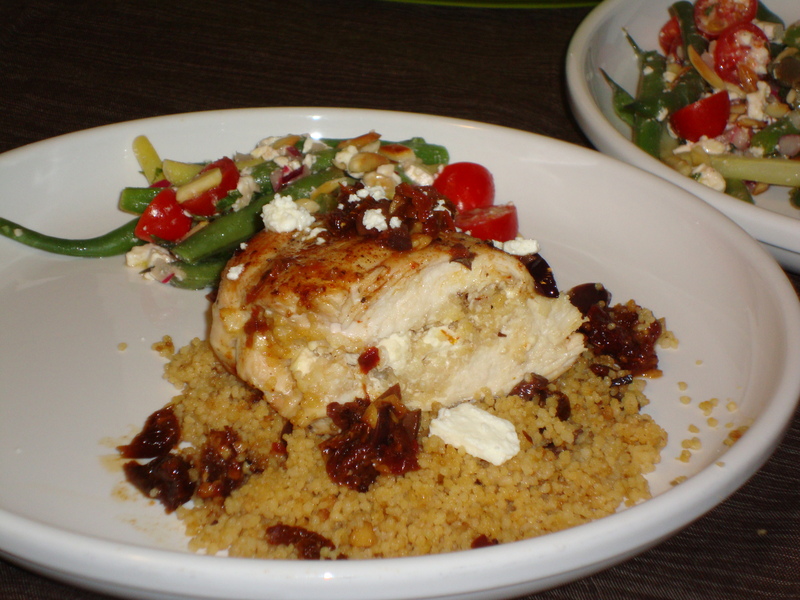 To serve, place couscous from oven on plate, cut chicken breast in half, top with sauce, crumble remaining feta cheese over. 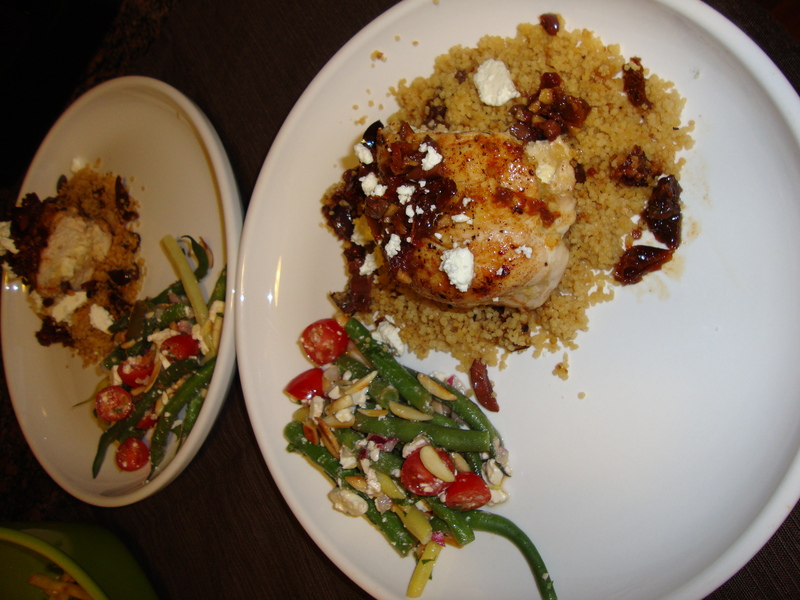 This entry was posted in Recipes and tagged chicken, couscous, feta, Mediterranean, olives, sundried tomatoes by Tricia. Bookmark the permalink.